Jerusalem (AFP) - Two of the last Jews in Syria have been spirited out of the country in a dramatic operation, but a third woman has returned to the war-torn nation after Israel rejected her visa, the rescue organiser said Tuesday. The operation, organised by Israeli-American entrepreneur Moti Kahana, took place earlier this year but has only now come to light due to the visa dispute with Israel. It involved Kahana's Syrian allies driving into the frontline city of Aleppo and picking up three Jewish Syrians -- a woman in her 70s and her two daughters -- along with one of their families, for a total of seven people, according to the entrepreneur. They managed to narrowly escape and make their way to Turkey, passing through a checkpoint managed by the Syrian Al-Qaeda affiliate, he said. But once in Turkey, only two of the women were given Israeli visas. The third, who had converted to Islam after marrying a Muslim man some years earlier, eventually returned to Syria along with her family. Kahana, who has links to Syrian rebels and has organised previous rescues, said he acted after a request from one of the women's sons, who lives in New York. "We acted to get them out as soon as possible because things were shifting on the ground. They lost water, they lost electricity -- it became the front line," he told AFP by telephone from the US state of New Jersey. He said the family did not want to leave, as they had not been informed of the rescue beforehand and were unclear on who was behind it. He said it was "necessary" to scare them into getting in a minibus. "I think outside the box," Kahana said. Once they arrived in Turkey, he realised it would be too difficult to get visas to the United States to be reunited with their families and instead focused on Israel. Under Israeli law, any Jew across the globe can seek citizenship. However those who convert to other religions are not immediately eligible. Kahana criticised the Jewish Agency, which oversees Jewish immigration to Israel, for allowing her to return to a war zone. He said the woman had not fully converted. Yigal Palmor, a spokesman for the Jewish Agency, confirmed the third woman was deemed ineligible and did not dispute Kahana's account of the rescue, but said the law must be followed. "If Mr Kahana has issues with Israeli laws he should lobby Israeli legislators rather than blame those who implement them," he said. Kahana stressed that he tried to work with authorities but became frustrated. "If I feel someone is in danger and there is too much bureaucracy to help then (I act)," he said. Palmor accused Kahana of being a "self-appointed freelancer". "The Jewish Agency will keep on rescuing Jews in dangerous places who wish to come to Israel and we will continue to do that discreetly as these situations command," he said. "Obviously any unnecessary exhibitionism on this matter, with the purpose of aggrandising certain self-appointed freelancers, can only harm the interests of the people concerned." Aleppo was once Syria's economic hub and a cosmopolitan city home to Syrians from a variety of sects and ethnicities. But it has been ravaged by fighting that began there in mid-2012, and is divided between government control in the west and rebel control in the east. The army regularly carries out devastating air strikes and barrel bomb attacks in the east, while rebel forces often fire crude and indiscriminate rockets into the west of the city. At the time of Israel's establishment in 1948, there were believed to be around 30,000 Jews in the country, but they left in waves over the years. The Jamaliya district of Aleppo was traditionally home to one of the oldest Jewish communities in the world. A US State Department religious freedom report on Syria in 2014 put the number of Jews in the country at fewer than 20. 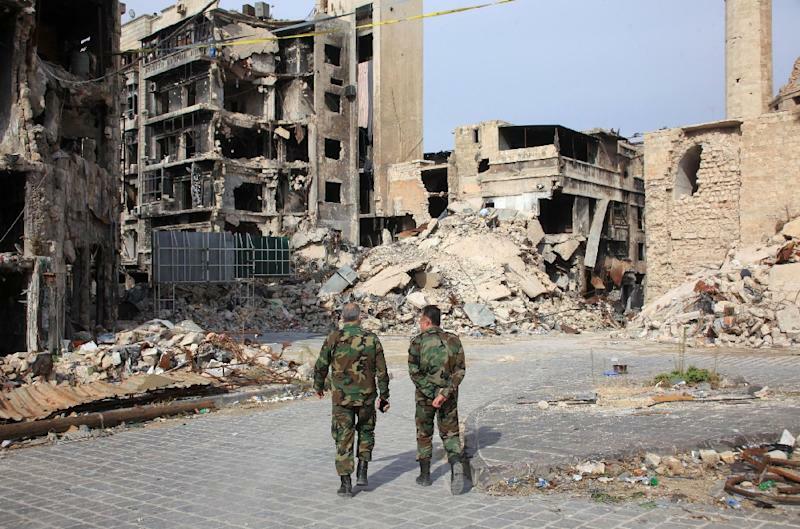 Syria's conflict has raged for more than four years and left over 250,000 dead.